I’m writing this post while sitting about three feet away from the fan in our master bedroom upstairs — trying not to think about how our old brick Tudor house stubbornly holds onto the heat of the day and just plain refuses to let it go. It’s tough to complain when we look forward to this season all year — the months filled with farmers market berries, juicy stone fruit and bushy sunflowers. The months when it doesn’t actually get dark until almost 10 p.m. and we eat dinner out on the picnic table or spread across the itchy grass, the neighbor’s bamboo tree quietly brushing up against the fence. This year, I planted a blueberry bush out back and Oliver dutifully waters it and checks for berries each day. He runs through the back door to report the count (which, for the past six weeks, has been “no berries, mama. Maaaaaaayyyyybe someday.”) Yesterday while doing his check he spotted THREE berries with his Aunt Christa and promptly snatched them up, refusing to share. It was a good day. I realize it’s been a bit quiet around here, and I want to thank you for your patience. While we’ve been soaking in all the good summer things, the days have also become much more constrained due to my new job (yay!). It’s been a pretty big transition for our little family — I knew that there were things I took for granted with my freelance schedule: the ability to turn recipe testing for work into dinner for the evening, do midday errands, schedule a dentist appointment whenever I pleased. These things are different now. We learned quickly that if we don’t meal plan and shop ahead, we just stare at each other at 6 p.m. and end up making quesadillas for dinner (which, let’s be real, isn’t always a bad thing). It took me a few weeks to figure out how to somehow work in exercise or watering the lawn or calling back the insurance company. We’re all getting used to it, and finding new footing. I usually wake before Oliver and sneak out of the house, getting to the office early to avoid the heinous commute. 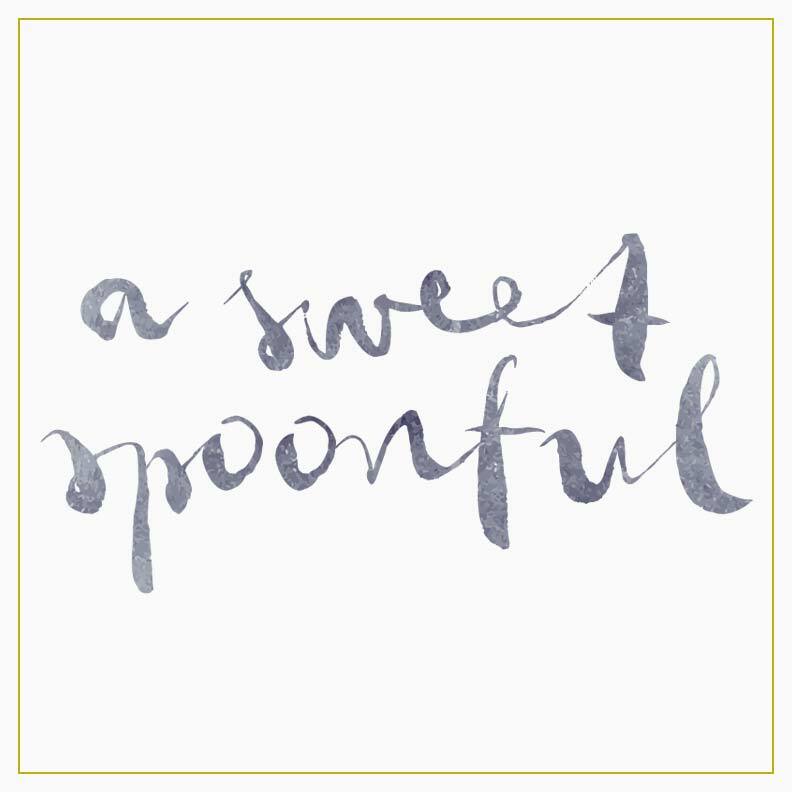 Sam has been meal planning and preparing a handful of dinners each week which is such an immense treat and lifesaver and relief and … did I say treat? He made homemade broccoli rabe and sausage pizza this week and chicken tinga tacos. It’s tough to complain. Given all of the disheartening and difficult-to-digest news lately, we all just feel so lucky. Today I’m leaving you with a recipe I wrote for the last issue of Edible Seattle. When I put a photo on Instagram awhile back, many of you messaged me asking for the recipe and I recently included it in a cooking class I taught at The Pantry and was reminded how ridiculously delicious it is. It’s a perfectly balanced whole grain bowl that’s hearty enough to act as a meal on its own. 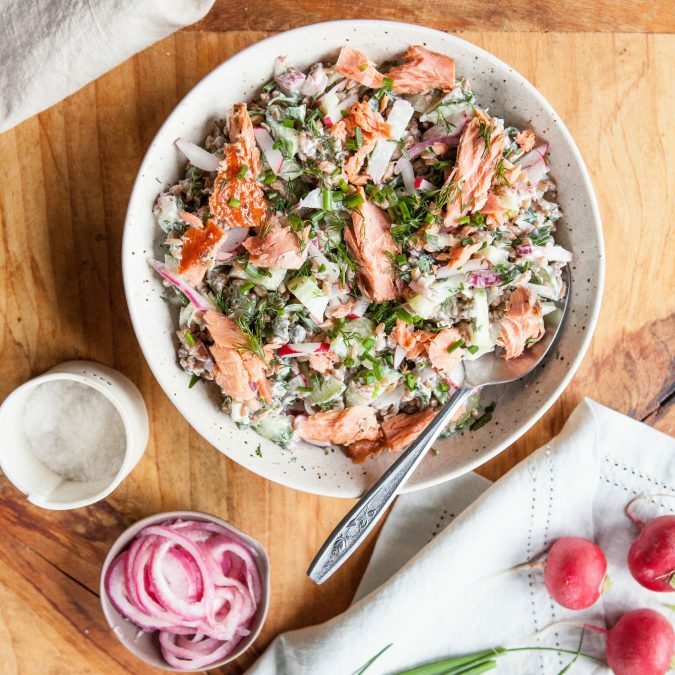 I love the combination of crunchy radishes and cucumbers with the toothsome rye berries, creamy dressing, and salty capers and salmon. Make this one ahead and it’ll be great for a few days in the refrigerator (yes, even with the dressing), and if you don’t have rye berries on hand, use any hearty grain you like (farro, wheat berries, kamut). I’ll see you back here soon with a summery savory baking recipe I’ve been working on (Oliver has been the lucky taste tester). And a few things that have been making me happy this season (books, podcasts, television and more!). 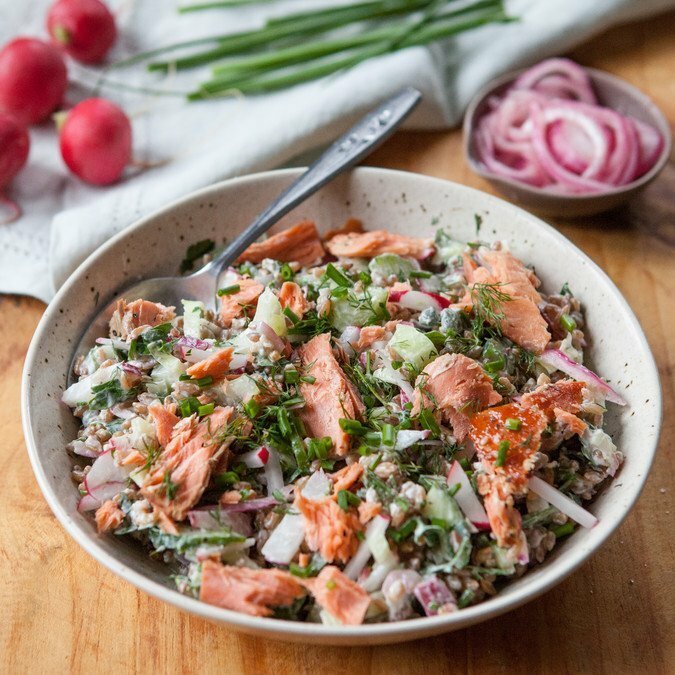 A vibrant, healthy grain bowl that leaves you satisfied and energized, this recipe comes together quickly if you cook the rye berries and prepare the pickled onions in advance — then you’re just chopping veggies and dressing the salad, and dinner is on the table. You’ll end up having some leftover pickled onions, which is great for all the future salads and grain bowls in your life. For this recipe you want to look for hot-smoked salmon that will be nice and flaky vs more of the cold-smoked salmon or lox. Place sliced onion in a small bowl. Bring vinegar, sugar and sugar to a boil in a small saucepan, stirring to ensure they’re mixed well. Pour over onion slices and let stand at room temperature for 1 hour. Drain onions before using. Note: can be made up to 2 weeks ahead. Keep leftover onions covered and refrigerated along with the vinegar mixture. 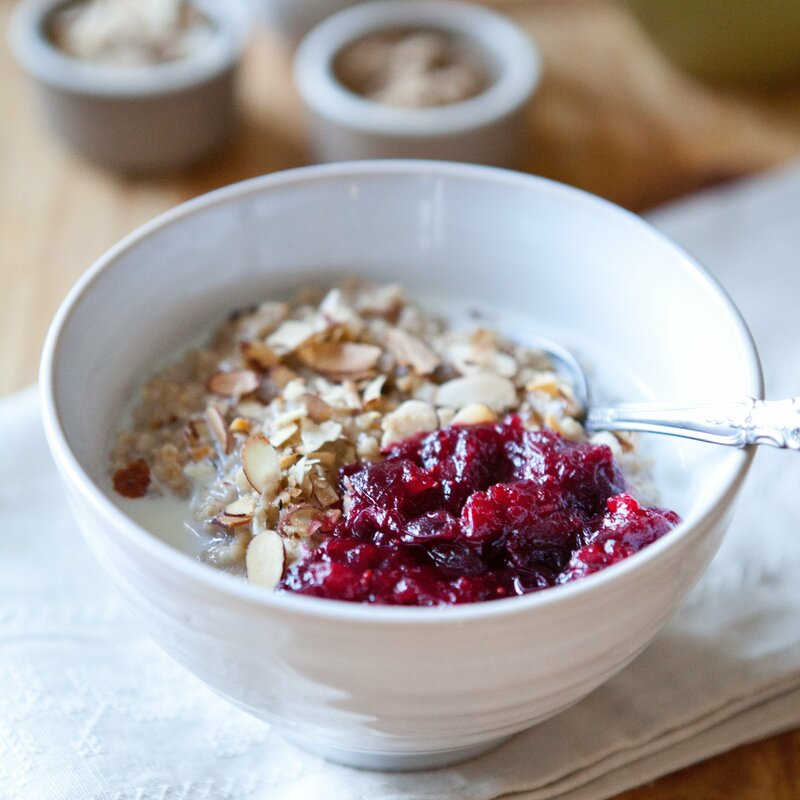 Place the rye berries in a medium saucepan with 4 cups of salted water. Over medium-high heat, bring the pot to a boil, and then reduce the heat to low and simmer, covered, until the grains are tender and chewy, 50–60 minutes. Remove from the heat, drain away any excess water, and set aside. Meanwhile, in a small bowl, whisk together the garlic, yogurt, olive oil, horseradish, apple cider vinegar, dill, salt, and pepper. Stir in the capers and set aside. In a large salad bowl, fold together the rye berries, cucumber, radishes, fennel, parsley, chives, and salt. Chop 1/4 cup of the quick-pickled onions, and fold them in. Dress salad with the creamy caper sauce. Carefully fold in the smoked salmon. Serve in shallow bowls, topped with additional chopped chives and dill. 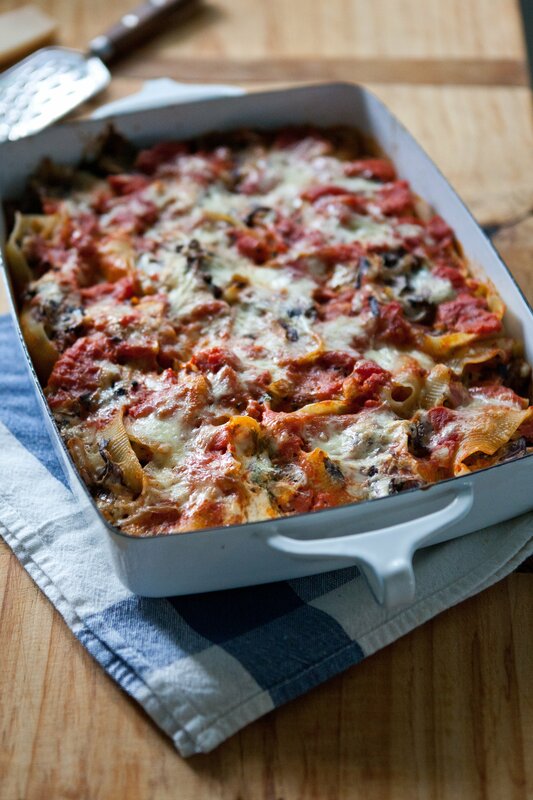 Leftovers can be refrigerated in a covered container for up to 4 days. The salmon does not look like smoked salmon at Zabars that we eat with cream cheese and bagels! Assume you can just use salmon? This sounds amazing! I have a hot smoked salmon that I love and I'm always looking for ways to use it. Can't wait to try! Wohoo! Awesome, Lori! I hope you enjoy it! I've been tucking away recipes to make while I am visiting my family on Lake Superior for two weeks this summer. My goal is to consume as much smoked trout as possible while I am there. That sounds like a pretty great plan, Nicole! Enjoy. Thanks for sharing. I can’t wait to hear what you’re reading! This looks perfect! I just made a salmon nicoise for my family last night - it was good, but I really wanted something different than the vinaigrette. I was craving something creamier and with more herbs (maybe due to the huge swath of dill I had picked up from the morning's Farmer's market). Love the use of yogurt in the caper sauce and rye berries. Added to this week's dinner plan. Thank-you! After much Googling, I think I figured out that hot-smoked salmon is a Pacific Northwest thing and that those of us on the East Coast might need to order online or substitute with smoked trout or something. I used trout. Tasty! If you want lox, though, I can get you lox. Added to this week dinner plan. Thank you!